Cate Tunney RMT graduated from Medix College in 2014. 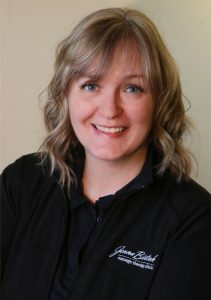 She is a Registered Massage Therapist and a member in good standing of the College of Massage Therapists of Ontario (CMTO) and the Registered Massage Therapists Association of Ontario (RMTAO). Cate is delighted to have found a home for her massage therapy practice by joining the team at Jenna Birtch Massage Therapy Clinic. We are delighted to have her with us! She has had the pleasure of working with a variety of people and conditions, including lower back pain, acute/chronic injuries, headaches, postural dysfunction, neurological conditions, and sports massage. She is passionate about working together with her patients to reach their health goals and needs, through a thorough assessment and treatment plan. After treatment, she takes the time to recommend and demonstrate stretching and strengthening exercises targeted specifically to her patients needs. Cate blends her massage using a wide variety of therapeutic techniques, including myofascial work, trigger point therapy, deep tissue, and isolytic release. She is enthusiastic to take further continuing education classes and stay up to date in the health community. Cate is passionate about the human body, and believes that a massage can enhance your overall sense of emotional and physical well being as well as your quality of life. Becoming an RMT was a long-nurtured goal of Cate’s since she first became interested in bodywork in the early 1990s. She trained as a Certified Aromatherapist in 1994, and her continuing education in bodywork includes Therapeutic Touch, Tellington TTouch (working with both animals and people), Usui Reiki, and Thai massage. Cate also completed a week-long training workshop with the Stretch to Win Institute in November 2017 and is certified as a Level One Fascial Stretch Therapist (FST). Cate is looking forward to continuing her studies with the fascial system and practicing more myofascial techniques and modalities. Cate’s interest in complementary therapies and body-mind practices grew during her years spent in martial arts training and yoga practice. Overall, Cate has a holistic and integrative approach to health and well-being. She finds it important to communicate the collaborative nature of a treatment session. It’s her priority to create a treatment plan that is based on her clients’ needs, and she strives to be an attuned and grounded presence for each client in her care. Call Jenna Birtch Massage at John Street Phone: (519) 681-7314 to book a massage today with Cate Tunney RMT!